When a new business enters an area for the first time some interesting things can happen. From the public’s perspective, a new company should serve the area it is in. If not, issues can arise. For the business itself, a new start-up is always a challenge and gaining the publics confidence can be a long struggle. But when Joan Carver, an artist from Sarnia, moved to London just 4 weeks ago she was not sure what to expect. Fortunately, one of her first sorties out into the community in Byron took her to Bijou Boutique, a women clothes store just opened in Byron Village. She went in for a quick look. The warmth and welcome she received was so impactful that, in her words,” inspired her to pick up her brushes again” after a long break. She wanted to show her appreciation for the lovely welcome and excellent service she received in the store. 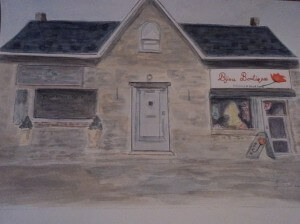 When she left the store she took a quick photo of it whilst sitting in her van outside and from that she proceeded to paint a picture of the store specially for its owner. It was a lovely moment when she brought the picture into the store and told the owner what had happened and how she felt. The new business which opened in Byron just last November had an effect similar to that of the chocolate shop run by Juliette Binoche in the 2000 movie ” Chocolat“. When Bijou Boutique opened it’s doors, owner Trish Wiggell wanted to bring more than just fashions to her clients. She has always been a true people person and believes that when warmth and kindness is given out it will always be returned. She brought that philosophy with her to her new ladies clothes store and it certainly seems to be working. The store may be small but it has a big heart. Joan is so happy to have had such a warm welcome to London. How great it would be to welcome all visitors and new residents to London in this way. Our community would flourish so much.